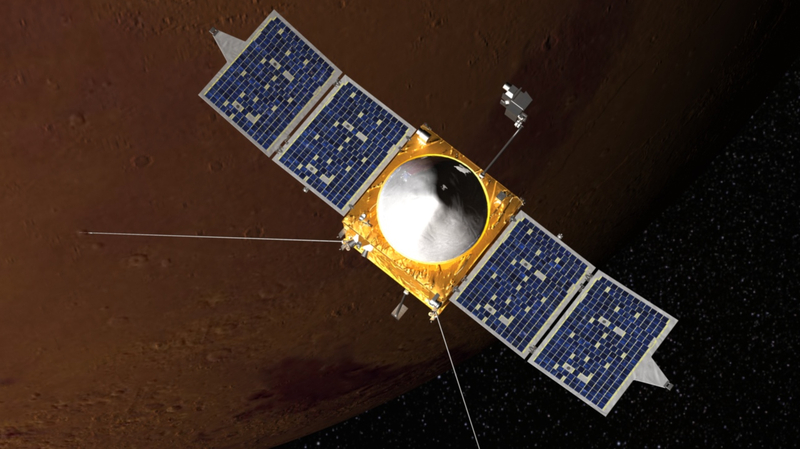 Satellite Missions destined for Mars – MAVEN, Mars Science Lab and Mars Rovers, launch only about every two years. The reason being the proximity of the Earth to Mars at mission launch so that the satellite catches up to the red planet in the shortest time possible. This animation, courtesy of Dave Folta/GSFC, shows the cruise trajectory of the MAVEN spacecraft, which was launched on Nov. 18, 2013. It will arrive at Mars on Sept. 21, 2014, to explore the planet’s upper atmosphere, ionosphere and interactions with the Sun and solar wind. The range and speed of MAVEN with respect to Earth, Mars and the Sun, both in metric (kilometers) and Imperial (miles) units, is displayed along with a date and the number of days until arrival at Mars. The Sun-centered trajectory of MAVEN, shown in blue, takes 308 days to transit from Earth’s orbit in green, to Mars’ orbit in red. The animation updates at a rate of twice per day and shows the MAVEN spacecraft, Earth and Mars locations.